The vinegar will turn into a light yellow tint. You don't have to freeze it. It can be kept outside the fridge, away from direct heat. Store in a dry, cool place. This is great for marinating red meats. We put in the flowers after vinegar has completely cooled? Can we use a bottle with plastic cap to infuse? yes, can use plastic cap. 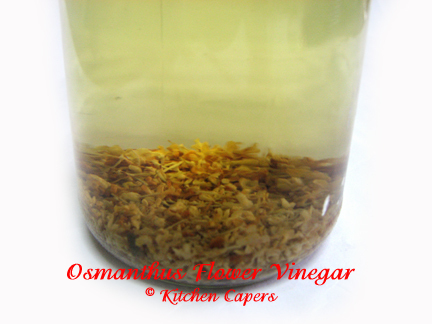 do you want the osmanthus? I'll share mine with you..
going to mail off your stuff next week..coz my maid still blur blur, don't want to leave her at home. Thanks for asking, Gina. I have a bottle of the dry flowers. Jo sent through my colleague when he went for training. Do you have the osmanthus sugar? I remember someone said that the ones in sugar are more fragrant than the dried ones. Do you want me to bank into your POSB account? I can ask my Singapore accounts to help me do it. Just let me know how much is everything. How do you do it in S'pore? In Malaysia, we have to put in the account no & also the payee's name. you want the sugared osmanthus? its S$3.10 per jar. I only worry that it may break during freight..
later i pm you on this. Do we put in the flowers while it's still warm or completely cool? Can I just leave the bottle on the dining table? It's quite bright there but no direct sunlight. Is it ok? must be cooled before you put the flowers in. can leave it anywhere in the house as long as its not under direct heat(stove) or sunlight.